So today, here in the city of Bradford – West Yorkshire, in the United Kingdom, in the month of Muharram, in the year 1436AH, after the Hijrah of our Messenger (صلّ الله عليه و سلّم‎), that coincides with the 8th of November 2014. Here at Masjid-as-Sunnah, we continue with explaining, Our Da’wah – i.e. the Da`wah of Ahl-us-Sunnati wal-Jamaa`ah. We will explain the call, and the invitation of Ahl-us-Sunnati wal-Jamaa`ah, and the Da`wat-us-Salafiyyah. We covered the first point, which was related to the issue of `Aqeedah. And, we mentioned the second point, which deals with the essentials of the religion, and the most important of those essentials. We covered the third point, which was related to the status of our Messenger (صلّ الله عليه و سلّم) and the Sunnah. Likewise, the fourth point, was regarding the status of the Sunnah, as it relates to the Qur’aan. The fifth point, is that which encompasses the Sunnah, and what the Sunnah is. So today, we move onto the sixth, seventh and eighth affairs. All of the 89 points that constitute the Da`wat-us-Salafiyyah, and that which the Salaf of this Ummah have placed in their books, and that which the Scholars of today are upon – those who adhere to the methodology and the creed of the Salaf (the earlier generations) – and these points have been summarized here. So, those are the three points – 6,7 and 8 – in discussion today. Their explanation, and of course, this whole issue revolves around the status of the Companions, and their position with regard to the religion itself. What is the status of the Companions of Allāh’s Messenger (صلّ الله عليه و سلّم)? The Raawee (narrator) of the Hadeeth – “The best of you, is my generation…” (mentioned previously) – said, “I don’t recall – if the Prophet (صلّ الله عليه و سلّم) mentioned two generations, after his generation or three generations”, meaning – with regards to the best of mankind, then did the Prophet (صلّ الله عليه و سلّم) mention, ‘The generation that came after, and the one that came after‘ only, or did he add to that, another generation. So, did the Messenger of Allāh mention the first 4 generations as being the best of mankind, or only the first 3? Regardless, what is important here is that these three generations at the least, and maybe the fourth, they are known as Al-Quroon al-Mufaddalah (The most virtuous of generations), and this is based on the aforementioned Hadeeth of the Prophet (صلّ الله عليه و سلّم). So, the best of all of the generations, are those three generations, and the best of those three generations, is the generation of the Companions of the Messenger (صلّ الله عليه و سلّم) – those who accompanied him. 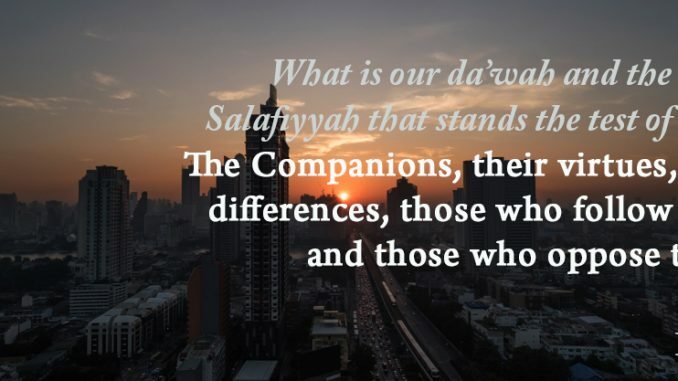 And there is a reason, as to why are we focusing upon the Companions? And that will become clear, Inshaa Allāh, as this Dars goes on. This indicates further, their excellence, virtue, and their station, with Allāh (سبحانه و تعالى). Allāh mentions that He is pleased with them, and Allāh also mentions that He is pleased with those who follow them, and that Allāh has prepared for them gardens of paradise, and He has given them the supreme success. Allāh (سبحانه و تعالى) mentioned with regards to them, that they are those who are “seeking Bounties from Allah and to please Him.” That they aided the Deen of Allāh, and aided the Messenger of Allāh (صلّ الله عليه و سلّم). This is the virtue of the Sahaabah (رضي الله عنهم). And this is why Allāh said that they are Saadiqoon – i.e. they were true to that which they said. Then Shaykh Fawzaan mentions that there are individuals from the Zanaadiqah (heretics), from the deviants who claim that they are Muslims yet they assault the honour of the Companions and they disparage them. They rebuke the Companions, and speak ill and revile the Companions. Even after Allāh (سبحانه و تعالى) has said “they are indeed the truthful ones.” So how can anyone, after knowing this – what Allāh has said about them, “Allah is well-pleased with them as they are well-pleased with Him” and He (سبحانه و تعالى) said that for them “is the supreme success.” And Allāh said that they are those, who are “helping Allah’s religion and His Messenger .” Then how can someone come along now and revile them, except that he is a Zindeeq (heretic) and a deviant, and an innovator – one who has innovated absurdities into the Deen of Allāh (سبحانه و تعالى)?! This Aayah, is a praise from Allāh, for the Ansaar. And, it is an extolling of them. Allāh (سبحانه و تعالى) made mention, of their praiseworthy characteristics, and Allāh (سبحانه و تعالى) affirmed for them, Al-Falaah, that they are the ones who will be successful. This is a clear-cut evidence that, Allāh (سبحانه و تعالى) protected them, from desiring and from covetousness. And for this reason, they became, as Allāh (سبحانه و تعالى) mentioned, “and they give the emigrants preference over themselves, even though they were in need of that.” They were themselves in need, yet when they heard there were people coming from Makkah with the Messenger Muhammad (صلّ الله عليه و سلّم), and that they had been expelled from their homes, and that their properties had been taken, the Ansaar embraced them, and looked after them. They are the Ansaar my brothers and sisters! This is why Allāh (سبحانه و تعالى) promised them success. When Allāh (سبحانه و تعالى) mentions the term ‘Khasaasah‘ – that, they themselves had this ‘Khasaasah‘ (which refers to hunger and poverty), and they themselves were in poverty, and they themselves were individuals were in need – they still gave preference to the needs of their brothers, despite being in poverty themselves. So, when the people of Makkah migrated to them – males, females, young and old – alongside Muhammad (صلّ الله عليه و سلّم), the Ansaar recognized them, to be their brothers, they recognized them to be believers. So instead of turning away from them, they embraced them and looked after them, and they consoled them, and opened up their homes and hearts to them. They shared with them their wealth and their homes (رضي الله عنهم أجمعين). May Allāh be pleased with all of them! So this is what the believers say, i.e. to forgive the Sahaabah. As for the Zanaadiqah (heretics), the innovators and the deviants, then they will not make this Du`aa for the Sahaabah. The believers will make this Du`aa, as `Aa’ishah (رضي الله عنها) has said, “We were commanded to make Du`aa for the Sahaabah”, and then, she quoted the Aayah above. Imam Bukhari collected this narration from `Aa’ishah (رضي الله عنها). In this Aayah alone, my brothers and sisters, there is the obligation that is upon us, with regards to the Sahaabah. That we are to make Du`aa for them and this is from our Deen. We seek from Allāh, forgiveness for them. We affirm the fact that they preceded us in Eemaan, because Allāh (سبحانه و تعالى) said that we are to say, “Our Lord! Forgive us and our brethren who have preceded us in Faith“. Allāh has affirmed Eemaan for the Sahaabah (رضي الله عنهم). So we affirm for them that which Allāh has affirmed for them of Eemaan. And we ask Allāh (سبحانه و تعالى) in our supplications to purify our hearts from rancor and hatred towards them “and put not in our hearts any hatred against those who have believed.” It is impossible that a believer should harbour hatred, malice or hostility towards the Sahaabah (رضي الله عنهم)! This Aayah is a praise of the Sahaabah, and an explanation with regards to that which is due to them from those who came after them. Since we came after them, what are we to do? And what is our duty to the Sahaabah? Then this is our duty to the Sahaabah. So this is the Sahaabah (رضي الله عنهم), in their virtue. Shaykh Fawzaan said, “If a person was to give a mountain of gold in charity, sincerely from his heart, and all of it was given in the cause of Allāh in charity, then it would not achieve in reward even a handful or even half a handful of food that the Sahaabah gave, never-mind gold! And a mountain of gold given by other than them does not equal even to half a handful that is given by them, of food”. This is the Sahaabah (رضي الله عنهم). And, this is by way of their virtue, and their station. Shaykh Fawzaan mentions, “from the increase in reward in terms of it being multiplied by amounts – then, it is in accordance with the nobility, and the excellence of the one who is doing the action.” So when Allāh (سبحانه و تعالى) multiplies the reward for a person, then it is connected to the excellence of the person himself, and this Hadeeth is a proof of that. So, the excellence of the Sahaabah, and their proximity to the Prophet (صلّ الله عليه و سلّم), and the generation that they lived in, and the sacrifice that they gave in their time – in and of itself, multiplied their reward to such a degree, that a mountain of gold can be given by any other than them, and that would not equate to a handful or half a handful of that which the Sahaabah gave. Who were the best of the Companions? May Allāh be pleased with all four of them. Abu Bakr ibn Abee Quhafah at-Taymi. And he is of course, well-known as Abu Bakr as-Siddeeq. His name was `Abdullaah ibn `Uthmaan. Allāh (سبحانه و تعالى) has mentioned that He (سبحانه و تعالى) is pleased with them. So then there come a people, after knowing all of this, my brothers and sisters, and then he accuses the Sahaabah (رضي الله عنهم) of being sinful and obscene? And he disparages and reviles them! May Allāh (سبحانه و تعالى) disfigure such individuals – those wicked and misguided people who would speak ill about the honour and the station of the Sahaabah (رضي الله عنهم), after knowing these verses of the Qur’aan. So, those who embraced Islaam before the conquest of Makkah, and those who embraced Islaam after the conquest of Makkah – then, Allāh has promised good to both of them, i.e. to those who became Muslim before, and to those who became Muslim afterwards. And the Husna here in the Aayah is the Jannah. No one after the Sahaabah (رضي الله عنهم) can be equated with them, in terms of their virtue. No matter what good deed a person has done, or no matter how great his level of piety reaches, even then such a person will not reach the Sahaabah. The best of the latter generations will not reach the (level of the) Sahaabah (رضي الله عنهم). But it suffices a person that he loves them, follows them, emulates them and praises them, and mentions them with good. He does not belittle them – not a single one of them, and he does not probe or search out for their mistakes, and he does not enter into discussions with regards to that which occurred between them of difficulties and tribulations – which entered upon them. So even with such trials and tribulations that befell them, they are far better, and more virtuous than other than them! That which occurred between them was not a choice that was upon them. They did not do it because they desired harm, or because they desired tribulations. None of the Sahaabah desired that. It is not permissible for anyone to argue with respect to the station of the Sahaabah (رضي الله عنهم). They are not to be mentioned, except with goodness and praise. And forgiveness and mercy is invoked for them from Allāh (سبحانه و تعالى). They are to be loved, followed and their example is to be taken – because Allāh loves them, and the Messenger loves them – and we love whomsoever Allāh and His Messenger loves. Allāh (سبحانه و تعالى) has said that He is pleased with them, and that he has granted them Jannah. He (عزّ و جل) has promised them a reward. Allāh has commanded the rest of the people to follow them, as did the Prophet (صلّ الله عليه و سلّم). Thereafter, if we ask ourselves the question – this religion that we are upon, how did it reach us? This Qur’aan and this Sunnah, how did it reach us? Did it not reach us through the path of the Sahaabah (رضي الله عنهم)? They are the Waasitah (intermediaries) between us, and the Messenger of Allāh (صلّ الله عليه و سلّم). They are the ones who conveyed to us the religion. The Prophet (صلّ الله عليه و سلّم) conveyed it to them, and they are the ones who conveyed it to the Ummah of Muhammad (صلّ الله عليه و سلّم), with complete trust! Every Hadeeth that has reached us, then you will find within it saying, ‘So and so narrated to us, who narrated to us, from a Companion, who narrates from Muhammad (صلّ الله عليه و سلّم)’. So, they are the intermediaries between us and between that which was given to Muhammad (صلّ الله عليه و سلّم) by way of revelation. They are the ones who preserved and memorized for us, his Sunnah. They are the ones who memorized and preserved the Qur’aan, and they are the ones who conveyed it to the rest of us. Furthermore, they are the ones who spread the religion in the east and the west. They are the ones who strove and strived in the Deen of Allāh, and they are the ones who spread the Da`wah – from one side of the earth to the other side of the earth. Was it not the Sahaabah who did all of this?! Who is the one who restrained and subdued the heretics and the apostates who went beyond bounds after the death of the Prophet (صلّ الله عليه و سلّم) – wasn’t it the same Sahaabah? Those who Allāh made steadfast, and He made steady the religion by way of them. So when the people of evil, and the people of sin and transgression wanted to take advantage after the death of the Prophet (صلّ الله عليه و سلّم), and they wished to cause schisms among the Muslims, and they wished to cause doubts in the religion of Islaam, by apostatising and causing the people to apostate and to turn away from Islaam – then Allāh, by way of the Sahaabah, and under the leaderships of the most virtuous of them – the likes of Abu Bakr as-Siddeeq – gave strength to the Religion of Islaam. And therefore, the religion was preserved by way of the Sahaabah (رضي الله عنهم). These are just a few, from the virtues and the station of the Sahaabah (رضي الله عنهم). The reason you find the authors of the books of `Aqeedah, mentioning the Sahaabah over and over again is because they wish to openly refute those who are hostile towards Islaam. Those who enter into Islaam, and they regard themselves to be Muslims, yet they wish to destroy Islaam from within, and wish to attack it. They wish to criticize Islaam, and they do not find anything to achieve their goal, except by the easiest method that they can find, which is to diminish the worth of the Sahaabah (رضي الله عنهم). They don’t want the people to follow the Sahaabah. They want to attack Islaam, without openly admitting to it because that would make it too obvious, and then no one would follow them. And they can’t attack the Messenger Muhammad (صلّ الله عليه و سلّم), because this would be too obvious. So, they begin by attacking those who carried this religion – the Sahaabah (رضي الله عنهم), who carried this religion to this Ummah. If they attack the Sahaabah and diminish the worth of the Sahaabah those who were the intermediaries between us and the Messenger of Allāh (صلّ الله عليه و سلّم), and the conveying of this Deen. The Qur’aan which was revealed to Muhammad (صلّ الله عليه و سلّم), who understood it, and clarified it – they were present when it were revealed. So people who attack the Sahaabah in this manner, know that they have found a route to attacking the Messenger Muhammad (صلّ الله عليه و سلّم). If you attack the Sahaabah, then you no longer have a Religion established from the Messenger Muhammad (صلّ الله عليه و سلّم). In the eyes of those who attack the Sahaabah, who were the ones to cite and narrate the religion, can no longer be relied upon as evidence. So, if you remove this body of the Sahaabah, then you’ve removed that connection to the Prophet (صلّ الله عليه و سلّم), and therefore, your religion thereafter has no basis to it. The Raafidah (Rawaafid or Shi`ah) – They are the worst of these groups. They are the worst of those who attack the Sahaabah. May Allāh disfigure them, and may He destroy them! Because, the intent of the Raafidah, is to attack the religion. They are the ones who openly attack and revile the Sahaabah. They wish to remove the connection between us and Muhammad (صلّ الله عليه و سلّم). The religion did not come to us except by way of the Sahaabah. So, in their eyes, i.e. in the eyes of the Raafidah, they say that the speech of the Sahaabah (رضي الله عنهم) cannot be relied upon. Therefore, they wish to attack the religion itself. And in reality, this exactly is their intent – i.e. to destroy the foundations of Islaam. The Khawaarij – They are those, who rebel against the Muslim rulers. And they are the ones, who rebelled against `Alee and the Sahaabah. They declare those who commit major sins to be unbelievers. That which carried them to this enmity towards `Alee, Ibn `Abbaas, and the rest of the Sahaabah was their harshness, and their excessiveness, and them going to the extremes and overboard in the religion. The intent of the Khawaarij, in reality, was not to attack the religion. Rather, they went overboard, and went to extremes. But their action was not based upon an intent, of destroying the religion. In fact, they claimed that they were spreading and defending the religion! So, they did what they did, in essence, because they claimed that it was in defense of the religion. Nevertheless, they went to extremes, and they are misguided, and they are the enemies of the Sunnah. The Naasibah (or Nawaasib) – They started attacking the Sahaabah (رضي الله عنهم), due to their political goals, similar to the Khawaarij. They singled out `Alee (رضي الله عنه), and attacked his Khilaafah. They attacked the family of the Prophet (صلّ الله عليه و سلّم), and the family of `Alee (رضي الله عنه), because of their desire for leadership, and for political gains. They claimed that `Alee (رضي الله عنه) was not suitable for leadership. But the intent of the Naasibah was not to attack the religion – though they are misguided and are likewise, the enemies of the Sunnah. We have already mentioned the virtues of the Sahaabah. Between them, there is virtue of some over others. And they all share the virtue of having Companionship with the Prophet Muhammad (صلّ الله عليه و سلّم). No one shares this virtue, or this attribute, except for the Sahaabah – neither do we, nor do the generations who came after them. And no person can be compared to the Sahaabah. Nevertheless, between themselves, i.e. among the Sahaabah, then some are more virtuous than others. And once again just because we mention the virtue of some of them over the others, it does not mean that we are belittling the one who is excelled over. So, just because we say that Abu Bakr was better than `Umar – it does not mean there is a deficiency in the worth of `Umar (رضي الله عنهما). It just means that Abu Bakr was more virtuous, even though there is excellence in both of them. So, it is not permissible to diminish or belittle the one, who is less virtuous. Why? Because, he is a Sahaabi, and he is from the Sahaabah – the Companions of Muhammad (صلّ الله عليه و سلّم). Who is more virtuous, `Uthmaan or `Alee (رضي الله عنهما)? And they are Abu Bakr, `Umar, `Uthmaan and `Alee. So, Allāh’s Messenger (صلّ الله عليه و سلّم) gave them the title of Al-Khulafaa ar-Raashidoon. Who gave them this title? Muhammad (صلّ الله عليه و سلّم). Not us. The Prophet (صلّ الله عليه و سلّم) called them ‘the Rightly guided Caliphs’. And the Prophet (صلّ الله عليه و سلّم) commanded us to follow their Sunnah, because, they proceeded upon the Sunnah of the Prophet (صلّ الله عليه و سلّم), and they understood it better than anybody else. Allāh (سبحانه و تعالى) has affirmed for them that, they are the ones who stood firm and steadfast. And they are the ones who remain steadfast upon the Sunnah, and they spread the Sunnah, from that which Allāh had given them, of knowledge, rulership, and guardianship (over the Ummah). As for the best of the Khulafaa, then the first is Abu Bakr, and then `Umar – upon this, there is Ijmaa’ (consensus) and the Muslims do not disagree upon this. But, there is some differing of opinion, regarding `Alee and `Uthmaan – i.e. which of the two is more virtuous than the other? So some of the Scholars said `Uthmaan is more virtuous than `Alee, and some said that `Alee is more virtuous than `Uthmaan, whilst giving virtue to all of them, and mentioning the excellence of all of them. So, the people differed with regards to this. So the best is Abu Bakr, then `Umar, then `Uthmaan based on textual evidence. The Messenger of Allāh (صلّ الله عليه و سلّم) would hear this, and he would not criticise. So from this we understand that the best out of `Alee and `Uthmaan is `Uthmaan (رضي الله غنهما). Also, because of the fact that the Ashaab-ush-Shooraa, the appointed body of the best of those who remained from the ten of those who were promised paradise – they were appointed by `Umar upon his deathbed, who said that, “You must choose amongst yourselves the best one, who is most worthy of being the next Caliph.” And who did they choose? They chose `Uthmaan. And this is a clear-cut evidence that, the best of the people upon the earth, at the time of the death of `Umar chose the best to lead them and that was `Uthmaan (رضي الله عنه). So, the affair is easy – `Uthmaan is better than `Alee. And when `Alee (رضي الله عنه) became the Caliph, then there was no one upon the earth who was better than `Alee (رضي الله عنه). No man walked upon the earth then who was more virtuous than `Alee (رضي الله عنه). This shows you the virtue of the Khulafaa with no doubt my brothers and sisters! When we hear those narrations of those Raafidah, and we hear what they have to say about these Khulafaa, and about the Sahaabah – they say that the Khaleefah after the Messenger of Allāh (صلّ الله عليه و سلّم) should have been `Alee. And they say: It is because he is the Wasee, i.e. the inheritor and the regent of the Messenger of Allāh (صلّ الله عليه و سلّم). They say that the Sahaabah oppressed `Alee, and seized power from him, and that they usurped the Khilaafah from him. The Raafidah curse Abu Bakr and `Umar, calling them the idols of Quraysh! Shaykh Fawzaan (حفظه الله) mentions that this is without doubt, misguidance, rather, it is Kufr and disbelief and opposes the Ijmaa’. For indeed, the Khaleefah after the Messenger of Allāh, was Abu Bakr, then `Umar, then `Uthmaan and then `Alee (رضي الله عنهم أجمعين). And we have been commanded to follow their path, and their ways. And if a person was to do that, then by Allāh, he will never go astray. Whoever follows the way of the Sahaabah, in their belief, in their worship, in their methodology, in their Fiqh and their outlook of life, and follow their understanding of the Qur’aan and the Sunnah then such an individual will never go astray, so long as he is sincere and truthful. It is impossible! Allāh says: “….and also, those who followed them (the Sahaabah) exactly, Allah is well-pleased with them as they are well-pleased with Him.” – (9:100) Allāh did not say this about the rest of us. May Allāh (سبحانه و تعالى) make us from those, who follow the way of the Sahaabah (رضي الله عنهم).